Once I wash my hair and moisturize it with whatever I’ve decided to moisturize with, I don’t think that much about moisturizing — well, I don’t think about what I’m going to moisturize with. And this, my friends, can cause problems. 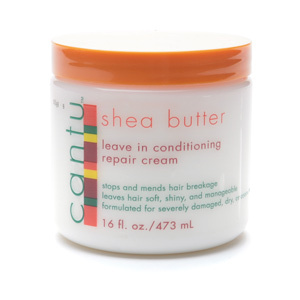 Case in point: This past Friday, I moisturized my hair with Cantu Shea Butter Leave In Conditioning Repair Cream. 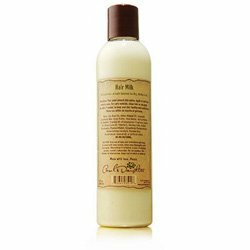 Over the next few days, I moisturized and sealed with Carol’s Daughter Hair Milk and Lisa’s Hair Elixir for no other reason than they were in my bathroom. Both the Cantu Shea Butter and the Hair Milk are pretty creamy moisturizers and my hair felt good. Everything was playing nicely and my hair was extra soft and fluffy — even in this ridiculously brutal and bitter weather. On Monday, I decided that instead of using Carol’s Daughter, I was going to give my hair a good spritzing with Oyin Handmade’s Juices & Berries. Why? I wanted to corkscrew my twists again and I wanted to use something watery that would help set the style. I sprayed on the product, sealed with Lisa’s Hair Elixir and started making my corkscrews (AKA bantu knots — I didn’t know they were called that too!). My hair started to feel tacky and sticky and, to make matters worse, there was a gummy grey residue thing happening. I was horrified. What the heck? It’s after 10:30 pm, I wasn’t trying to wash my hair. I wanted to get to bed! I was tired and now I had to deal with grey residue? Chupse! I don’t know what I was thinking because I know that I would go to work with grey residue in my hair. I wake up with just enough time to take a shower, get dressed and get out of the house. I don’t have a minute to spare — especially during the first week back to work after the holidays. Please. When I took the twists down Tuesday morning, praise God, there was nothing going on but some soft hair and some new curls. Sigh of relief. I did return to moisturizing with the Hair Milk and I will leave the Juices & Berries alone for right now. The moral of this story? Be very careful when mixing product lines because you do not know what will happen when various ingredients combine on your hair. You can get anything from perfect hair (yay!) to grey or white residue or worse (boo!). Next time I wash my hair, whatever I initially moisturize with I will continue to moisturize with until my next wash day. Next Post Has anyone tried the Tightly Curly method? yeah… make sure you rinse your hair good good of conditioner before you put gel in your hair. you get things that look like boogers if you don’t. gel and infusium don’t mix, either. the honey (or glycerine?) in juice and berries is likely what made your hair sticky. i like oyin, but their delivery time is madness. I normally don’t rinse my hair completely of conditioner and it doesn’t make nasty hair balls… except for when I use certain products. Even with a clean head of hair, Miss Jessie’s Curly Pudding and I don’t mix. I ordered my Oyin stuff from honeyfig.com — I got it in a week. I love honeyfig.com! And their shipping charges aren’t ignorant. I have to check the ingredients, but it does contain glycerin… which I really shouldn’t be using in the winter. Hence, my Juices & Berries will stay right on my shelf until spring (although I did like it as a braid spray)!